This heresy, which I’ve called proportional discipleship, mandates that a person’s commitment to the kingdom of God should not exceed the average spiritual level of the surrounding society by more than one standard deviation. 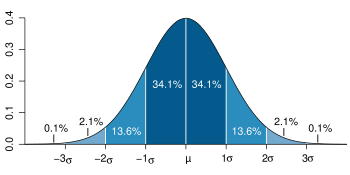 According to the empirical rule, usually 68% of the population is within one standard deviation of the norm. That means that, according to the principle of proportional discipleship, we can be 34% more dedicated to God than the average, and still not be too different. And that’s good enough, isn’t it? This principle has profound effects in the areas of Christian ethics. It suggests that God doesn’t really expect us to follow him in any area where we have reason to believe that less than 85% of society will tolerate his position. After all, he is an understanding god, and knows our weaknesses. Anybody in the remaining 15% has gone too far in devotion to God (statistically speaking), and deserves whatever they get. Check my math. We may be onto something. Hmmm, I wonder how many standard deviations above the norm would be represented the life work of Martin Luther King Jr. Total devotion to God paired with liberation in the here and now just might have changed a community or two. There are responsible and strategic ways to be radical, influential, revolutionary and world changing. Let us not settle for nominalism; If God calls our lives to full devotion, let’s honor that responsibly.